There is plenty to do under the sun in San Diego, CA, and ( SUP ) stand up paddleboarding is just one. With gorgeous weather year round, paddlleboarding is the perfect outdoor activity in San Diego, CA. The sport is rapidly growing. and with that growth comes more companies offering the opportunity to get out on the water. To be able to experience the breathtaking view of San Diego from the water is priceless, and I take full advantage of every opportunity I get. I fell in love with paddle boarding the moment I stepped on one. My favorite time to paddle is early morning, anywhere from Sunrise to 8am. It’s the quiet time. Everything is just beginning to awaken. The birds, people, traffic - the world is quiet. The still, calmness of the water is very therapeutic . This is just one reason I love to paddle. They way it quiets my mind, and the breath connects with every stroke of the paddle, it is meditation to me. Now Let me introduce myself, Hello, I am Dana. The founder of SunChaser SUP and Yoga. It was the love of the water that started this adventure for me. We will get into all things physical aspects of paddle boarding another time. This is all about the paddle. I am going to share with you a few of my favorite spots around town. With endless paddle spots in and around SD, it was hard to pick my favorites. I am going to navigate my 5 favorite paddle spots here with you. These are just 5 of my favorite hidden paddle gems in San Diego. This is my number 1 favorite spot, but I am a little bias, since this is one of my SUP yoga locations. I work with the The SUP Connection at this very quiet spot. They are a great company, friendly and very knowledgeable. Most people are pretty shocked to hear there is paddle boarding in Liberty Station, "you paddle where?" Yes I do, it is has public water access, public restrooms, and plenty of parking. The beach we launch our boards from is pretty small, not ideal for swimming or sunbathing. What I like about this location is after a great paddle, there is so much great food in the Liberty Station Market to enjoy. There is less water traffic than Mission Bay. It is tucked away from the business of the beaches, and it is surrounded by pure beauty. This location is a great beginners Once you launch from shore head West under the N Harbor Bridge and to the left you get breathtaking views of the downtown skyline. That is pretty cool at sunset too. From there you will find a small beach called Spanish Landing Park East, a little beach spot to take a break if you need. 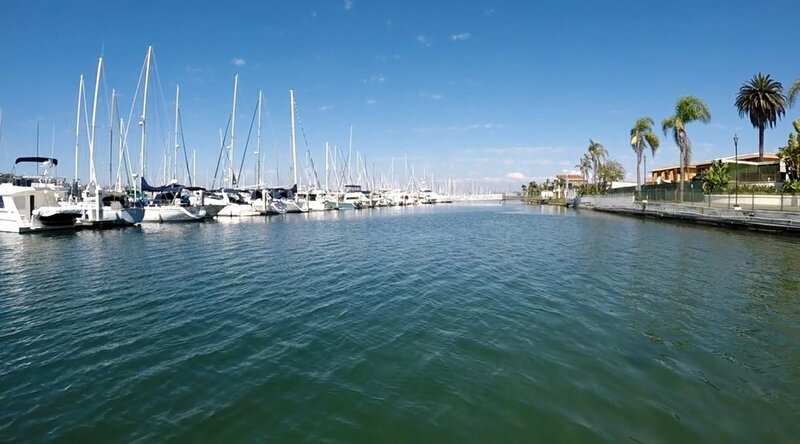 Paddle through the boat docks to the Sheraton San Diego Hotel and Marina. Dodging and Ducking under walkways all along Harbor Island Drive. Then back towards Liberty Station. You will not be disappointed with your paddle out. This is our second favorite spot to paddle, Kellogs Beach in Point Loma. It used to be a very quiet private beach, but many people have now discovered its beauty. This location is easy to launch in and out. Parking was easy for me, although can be challenging at times. Kellogs beach is tucked away in a neighbor any beautiful day will bring crowds to this beach. I paddle toward the Kona Kai, a resort located on the tip of Shelter Island. Take a leisurely paddle through the docks near the resort, or a little more adventurous you can paddle around the island. Any paddle you choose has breath taking views of point loma and downtown San Diego. If you choose a long paddle out, just remember you have to make that same paddle back with hopes the wind has not changed directions- Just saying. * Since Kellogs beach is located in a neighbor be respectful of those that live near the beach. We LOVE to paddleboard in Mission Bay, San Diego. This is our 3rd favorite spot. Mission Bay is a salt water Bay or Lagoon, it is the largest man made Aquatic Park in the Country. There are SO many coves to paddle around the bay. With so many options in the Mission Bay it is hard to choose where to go. Depending on which area you decide to go out in you will need to be mindful of the wind. The wind definately plays a factor in your paddling. We like to launch near the Catamaran, this is another one of our SUP Yoga locations in Mission Bay. The wind picks up usually about noon, and is an Eastern wind. There is 27 miles of shoreline in Mission Bay leaving plenty to do and see. Check in to see where on the bay you are planning to launch from - be mindful of the jetskies, boaters, and even sailboats. Know the rules of passing another vessel in that area before paddling out. If you are looking for a little more sea life during our paddle then head over to Quivira Basin, also know as " Wildlife Loop"
It is mainly dock and marinas in this area, so the boat traffic is a bit more rapid here. With lots of fishing boats coming in and out, knowing the rules of the channel when passing another vessel is important. Stay as close to the shore line as you can. There is no public launch area here, you must have dock permission to launch your board or rental with one of the local companies. When Stand up paddleboarding towards Mariners Cove- keep your eyes open for sea life in this area. Garibaldi fish have been spotted often in this area. We enjoy paddling here because the current and wind have no effect on these areas, oh yay and paddling with the sea creatures is fun too. Take your paddle to a bit more of the open ocean by paddling out towards Hospitality point. The swell will begin to pick up. Creating a little more wake for you and challenging your balance a bit more. Just remember to breath, relax and have fun. Located East of Belmont park. This is a very mellow cove to paddle around in. The area is well populated in the summer with family picnics, partyies and gatherings. Parking can be tricky in the summer due to the amusement park across the street. It is a protected part of the bay from the wind. This is a great area for beginner paddlers, or anyone looking for a shorter paddle around. Bonita Cove is in Mariners Basin. You can take a nice paddle across the ocean's entry channel over toward Hospitality point or Quivira Way. Check in with the wind direction here and the swell from the ocean. This paddle is not recommended for beginners, or first time paddlers. Stayed tuned as we navigate the waters of San Diego together. WE are all in search of an adventure, and we all just want to chase the sun.